PETBUCKs, a non-profit corporation (hereinafter PETBUCKs) is committed to respecting your online privacy and security. We've structured our Web site so that, in general, you can visit us on the Web without identifying yourself or revealing any personal information. Once you choose to provide us personally identifiable information (any information by which you can be identified), you can be assured that PETBUCKs will never sell, rent, lease or exchange your personal information with other organizations. 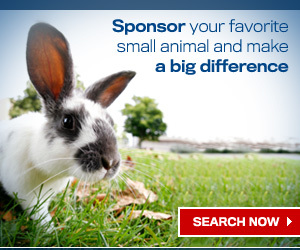 We use your information to help you complete a transaction, communicate back to you, send you PETBUCKs sponsor packet and to update you on your sponsored pet. Credit card numbers are used only for payment processing and are not retained for other purposes. PETBUCKs will not sell, rent, or lease your personally identifiable information to others. Unless we have your permission or are required by law, we will only share the personal data you provide online with business partners who are acting on our behalf to complete the activities described above. PETBUCKs strives to keep your personally identifiable information accurate. We make every effort to provide you with online access to your sponsor registration data so that you may update or correct your information at the PETBUCKs site where it was submitted. 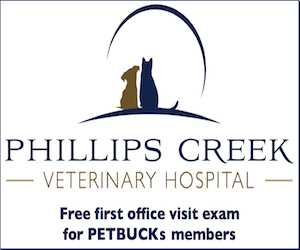 To review or correct your personal information please visit us at www.PETBUCKs.org. To protect your privacy and security, we will also take reasonable steps to verify your identity before granting you access or enabling you to make corrections. PETBUCKs is committed to ensuring the security of your information. To prevent unauthorized access, maintain data accuracy, and ensure the appropriate use of information, we have put in place appropriate physical, electronic, and managerial procedures to safeguard and secure the information we collect online. We use Internet encryption software, Secure Socket Layer (SSL) protocol, when collecting or transferring sensitive data such as credit card information. PETBUCKs provides the services described on its web site to you subject to the following conditions. All content included on this site, such as text, graphics, logos, photographs, button icons, images, audio clips, digital downloads, data compilations, and software, is the sole and exclusive property of PETBUCKs Corporation or its content suppliers and is protected by United States and international copyright laws. The compilation of all content on this site is the exclusive property of Compassion International, Inc. and protected by U.S. and international copyright laws. PETBUCKs’ trade names, trademarks, trade dress, and service marks, including those marks indicated on our web site are the sole and exclusive property of PETBUCKs including, without limitation, designs, logos, page headers, button icons and scripts ("Marks"). PETBUCKs Marks and trade dress may not be used in connection in any way not expressly authorized in writing by PETBUCKs or in any manner that is likely to cause confusion among the public, or in any manner that disparages or discredits PETBUCKs, Corporation. All other trademarks not owned by PETBUCKs that appear on this site are the property of their respective owners. PETBUCKs grants you a limited, nonexclusive, nontransferable, and revocable license to access and make personal use of this site and not to download or modify it, or any portion of it, except with express written consent of PETBUCKs Corporation. This license does not include any resale or commercial use of this site or its contents; any collection and use of any information, images, content or photographs or any derivative use of this site or its contents; any downloading or copying of information for the benefit of another; or any use of data mining, robots, or similar data gathering and extraction tools. This site or any portion of this site may not be reproduced, duplicated, copied, sold, resold, visited, or otherwise exploited for any commercial purpose without express written consent of PETBUCKs. You may not frame or utilize framing techniques to enclose any Marks, photographs, content or other proprietary information (including images, text, page layout, or form) of PETBUCKs web site without express written consent. You may not use any meta tags or any other "hidden text" utilizing PETBUCKs’ web site name or Marks without the express written consent of PETBUCKs. Any unauthorized use terminates the permission or license granted by PETBUCKs, to access this site. DISCLAIMER OF WARRANTIES AND LIMITATION OF LIABILITY THIS SITE IS PROVIDED BY PETBUCKs CORPORATION ON AN "AS IS" AND "AS AVAILABLE" BASIS. PETBUCKs CORPORATION MAKES NO REPRESENTATIONS OR WARRANTIES OF ANY KIND, EXPRESS OR IMPLIED, AS TO THE OPERATION OF THIS SITE OR THE INFORMATION, CONTENT OR MATERIALS INCLUDED ON THIS SITE. YOU EXPRESSLY AGREE THAT YOUR USE OF THIS SITE IS AT YOUR SOLE RISK. PETBUCKs CORPORATION DOES NOT WARRANT THAT THIS SITE, ITS VENDORS SERVERS, OR E-MAIL SENT FROM THE PETBUCKs WEB SITE ARE FREE OF VIRUSES OR OTHER HARMFUL COMPONENTS. PETBUCKs CORPORATION WILL NOT BE LIABLE FOR ANY DAMAGES OF ANY KIND ARISING FROM THE USE OF THIS SITE, INCLUDING, BUT NOT LIMITED TO, INDIRECT, INCIDENTAL, PUNITIVE, AND CONSEQUENTIAL DAMAGES. PETBUCKs reserves the right to make changes to this site, policies, and these Conditions of Use at any time. If any of these conditions shall be deemed invalid, void, or for any reason unenforceable, that condition shall be deemed severable and shall not affect the validity and enforceability of any remaining condition. Cookies are used to determine the success of PETBUCKs’ website and marketing campaigns. This allows us to be good stewards with the donations that are given to us to determine our online effectiveness, which also helps keep our expenses low. In addition to cookies, PETBUCKs and its third party vendors use other technologies, such as Google Analytics, to gather information on how our users interact with our web site and to help us efficiently monitor our web site and marketing campaigns. These technologies, for example, show us popular pages, conversion rates, click-throughs and other information that can be used to improve our website. I think it's a great idea because I think it's a heck of a good cause.